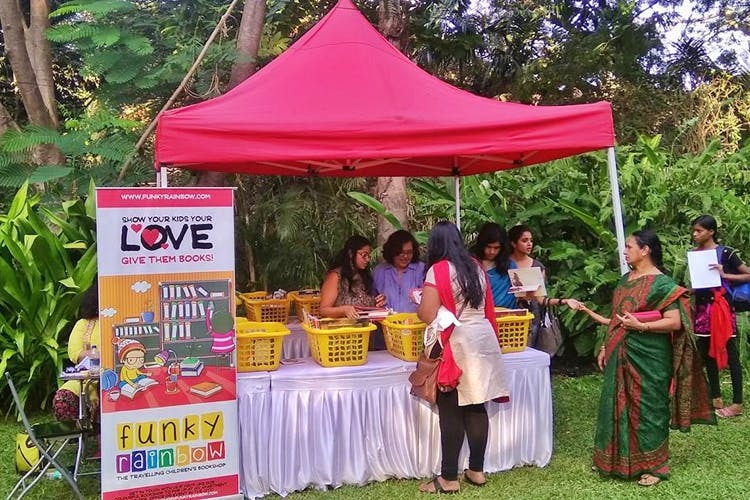 Funky Rainbow pops up at events in different parts of the city with a collection of the best in Indian children’s books for kiddos from the ages of 1 to 16. The bookshop also does private events, so give them a buzz if you want the best of children’s literature for sale at the venue. A travelling children’s bookstore, Funky Rainbow is a group of four members who bring the best of Indian children’s books for sale at kiddie events happening around the city. From lit fests like Bookaroo to Chalo India, Funky Rainbow has brought their curated list of books, for kids from the ages of 1 to 16, and spread the love for tomes amongst the minors in the bibliophile communities. Started four years ago as a pop-up bookstore for Bookalore, a book club for kids where they could interact with the authors and illustrators of the stories, Funky Rainbow began its journey by collecting books from local authors and publishers and now has around 4,000 books under its umbrella. Setting up shop at around two to three events a month, Funky Rainbow deals exclusively in Indian children’s literature. So if you’re looking for the Harry Potter series you won’t find it here. What you will get from these guys is a curated list of the best of Indian children’s literature that is a little hard to find elsewhere. From books for early readers like the adorable Maharani The Cow by Christy Shoba Sudhir to Every Dog Has Its Tale by Ranjit Lal for the more mature readers, the kids are sure to find a paperback they love. As we all know a good book is priceless, but that doesn’t stop the price tags from being quite reasonable, starting at INR 100. Keep a close eye on their Facebook here to know where to catch them next. Would you like Funky Rainbow to bring their books and set up shop at your school, apartment or event? Get in touch with them on Facebook or call them at +91 9980509771.